I am always looking for different icing and glazes for my favorite sugar cookies. I came across this great glaze this month in Southern Living magazine, pg 134. I want to share it with you, go get this edition of the magazine, it’s loaded with some awesome recipes and ideas for the holidays. I posted my Sugar Cookie recipe from my family last time. Bring 1 c red wine (such as Merlot), 1Tbsp light brown sugar, 1 (4×1/2 “) orange peel strip and 1/8 tsp each ground allspice,ground cloves, ground nutmeg and ground cinnamon to a boil in a saucepan over high heat; boil 7 to 10 minutes or until reduced to 1/4 cup. Remove from the heat, and stir in 1/4 tsp Kosher salt till dissolved. Discard the orange peel and stir in 2 cups powdered sugar until smooth. 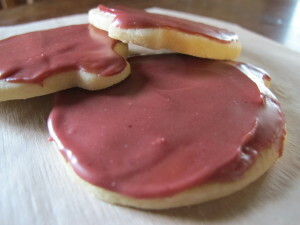 This entry was posted in From the kitchen, Recipes and tagged mulled wine glaze, sugar cookie glaze by admin. Bookmark the permalink.